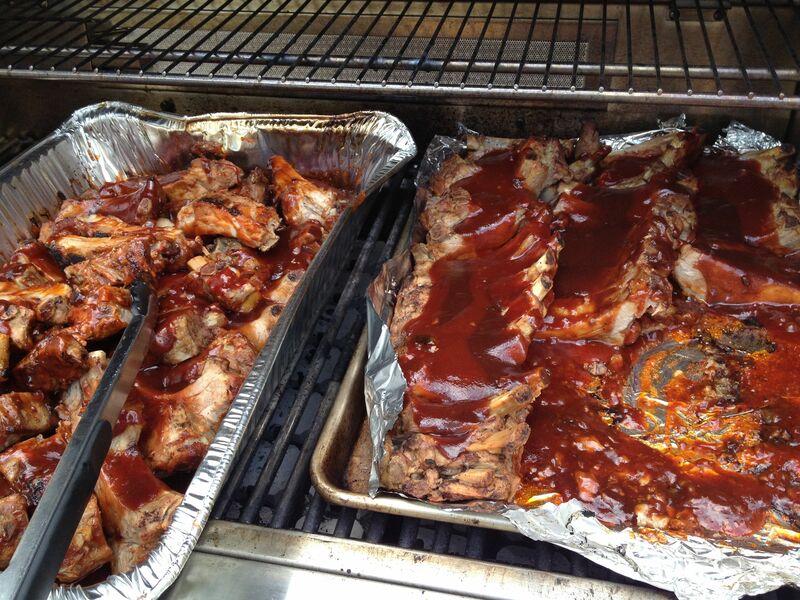 Whether you’re feeding 6 or 60, the process for cooking ribs is the same. (And note that this is more of a process than a recipe, so don’t worry too much about measuring; it’s the pre-braising that makes all the difference.) To economically feed our anticipated crowd, I set out to Costco for 3 value packs of pork loin ribs (6 full racks), bratwursts, barbeque sauce and heavy duty aluminum roasting pans. (That was the hardest part! Trips to Costco always wipe me out.) For a smaller family dinner, figure 3 servings per full rack of meaty pork loin ribs (or maybe 2 servings per rack for big appetites). 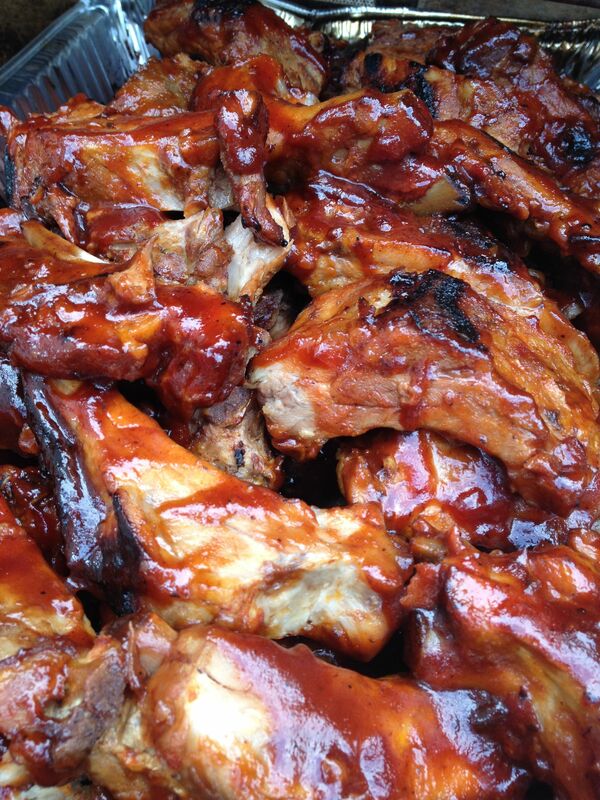 Once home, I set the oven to 350ºF and cut open the packs of ribs (over the sink – they drip) and set all 6 racks in an aluminum pan. Purists would pat dry the racks and cover with a homemade rub of salt and secret spices. I was in party panic mode at this point so did none of this; instead, I grabbed some seasoning salt from my spice drawer and generously seasoned both sides of each rack. Then I poured about ½ a big jug of barbeque sauce (again – not even homemade!) and about a cup of water into the pan, covered ribs with a piece of parchment paper, and then covered the pan tightly with foil. Into the oven for at least 2 hours, until you smell it and the meat is tender and falling off the bone. (My 7-year-old was driven crazy by the aromas in our kitchen and insisted that this be her dinner; it was.) 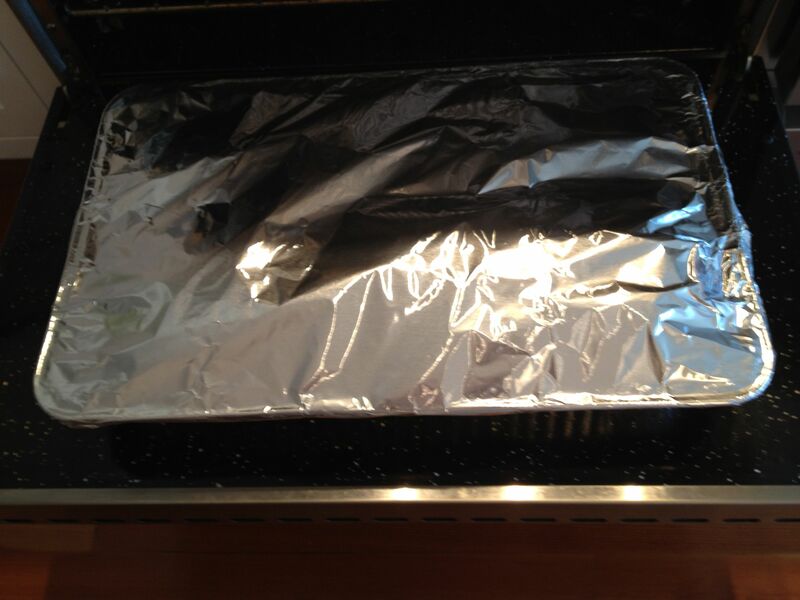 Take out of the oven (carefully – the pan will be full of liquid) and let cool. 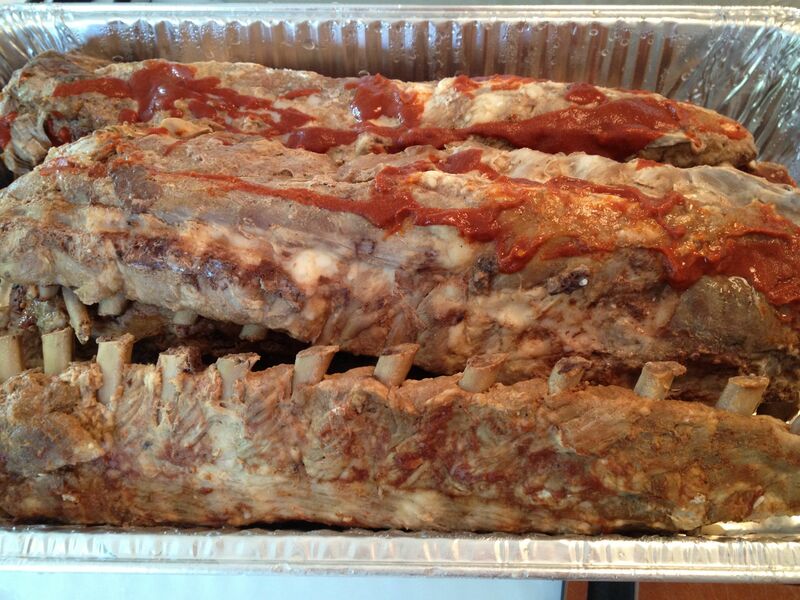 Then gently transfer rib racks to a clean pan (one that will fit in your refrigerator), add a little extra BBQ sauce if you like, cover with foil and refrigerate overnight. 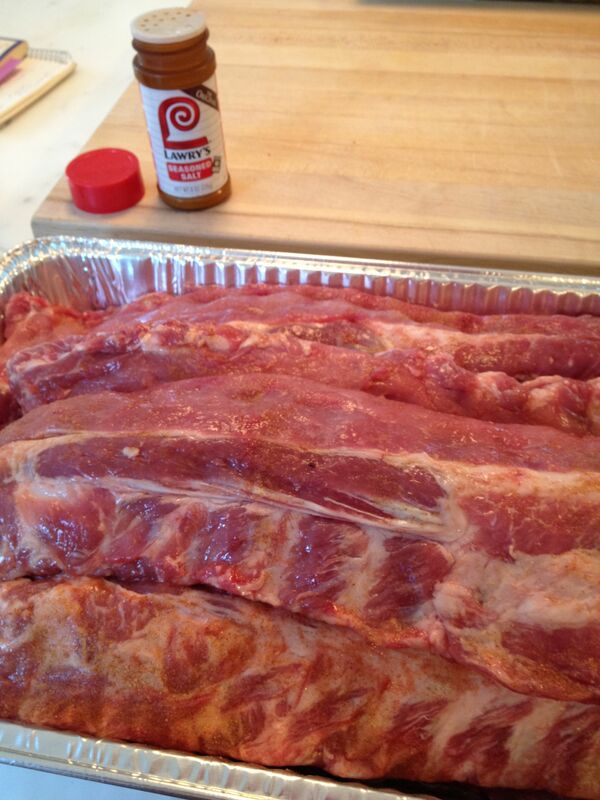 This will firm up the ribs and make them much easier to cut. Heat grill to medium-high. If you have a smoker box, add some water-soaked mesquite wood chips. Place pan(s) on top of grill grates and cover grill. Cook about 5-7 minutes until sizzling and meat is starting to crisp. Turn grill to low. Drizzle with your favorite BBQ sauce – I used 2 different brands (Sweet Baby Ray’s and Anna Mae’s Smokey Sweet Sauce, both from Costco) plus a little bit of hot pepper sauce. 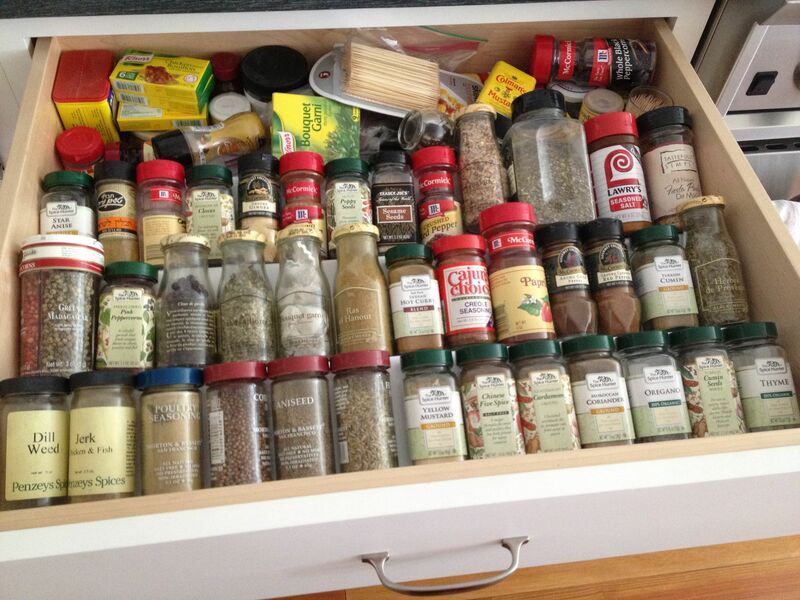 You can use any brand or combination or quantity that you like. 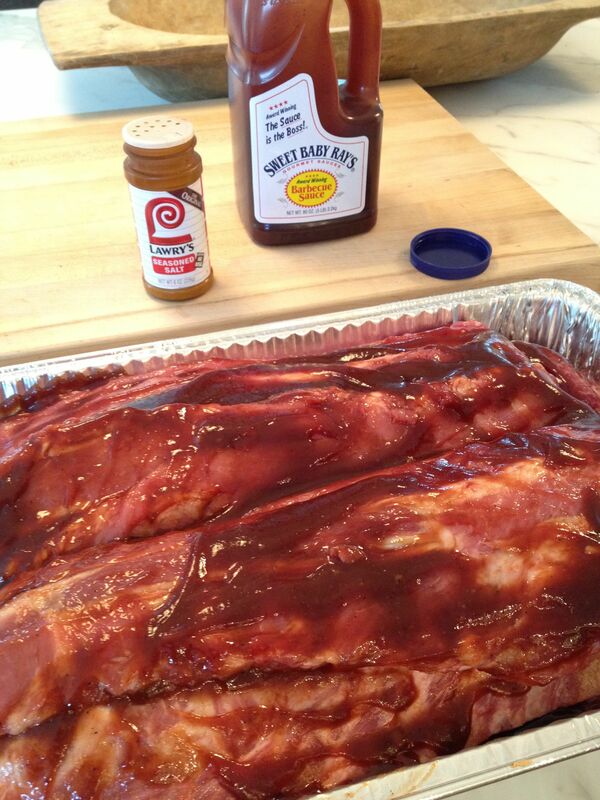 Use tongs to coat both sides of the rib pieces in BBQ sauce. 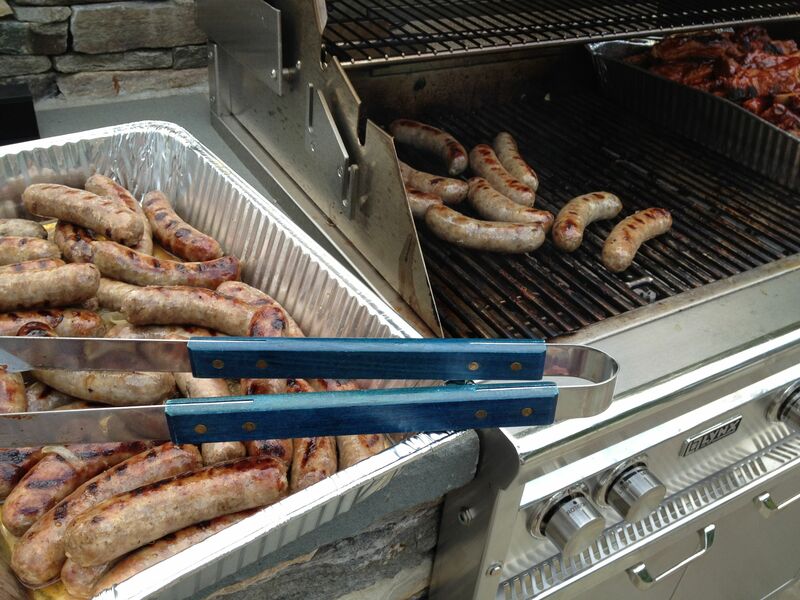 After coating in sauce, I combined the 2 rib pans to make room on the grill for the brats. (Sausages, not kids!) Once ribs are nicely glazed with sauce and heated all the way through, turn off grill (or alternate between off and low) and serve directly from the grill. 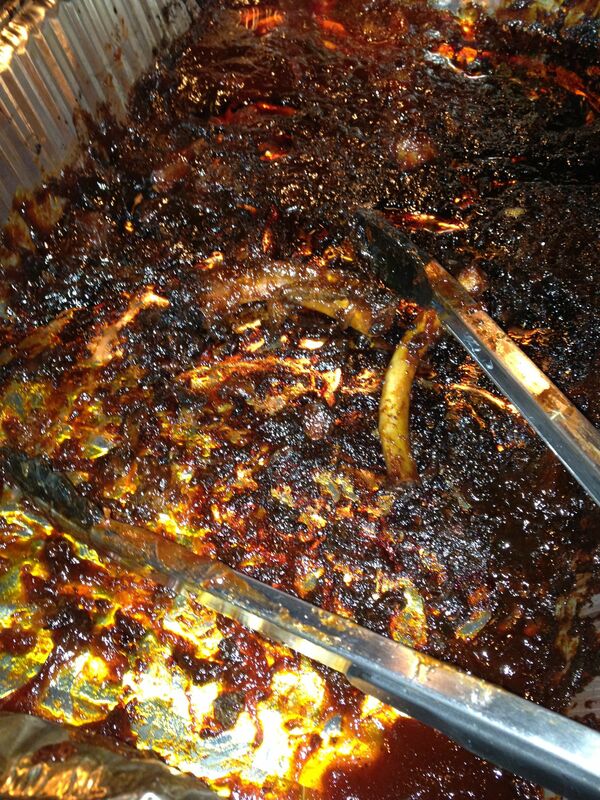 I wish I had set aside some of the ribs for a “beauty shot” (or for a post-party snack), but they disappeared! Nothing was left but a few bones and some crispy scraps (which were tasty). If I can get my act together tomorrow I’ll start another batch for Father’s Day dinner. 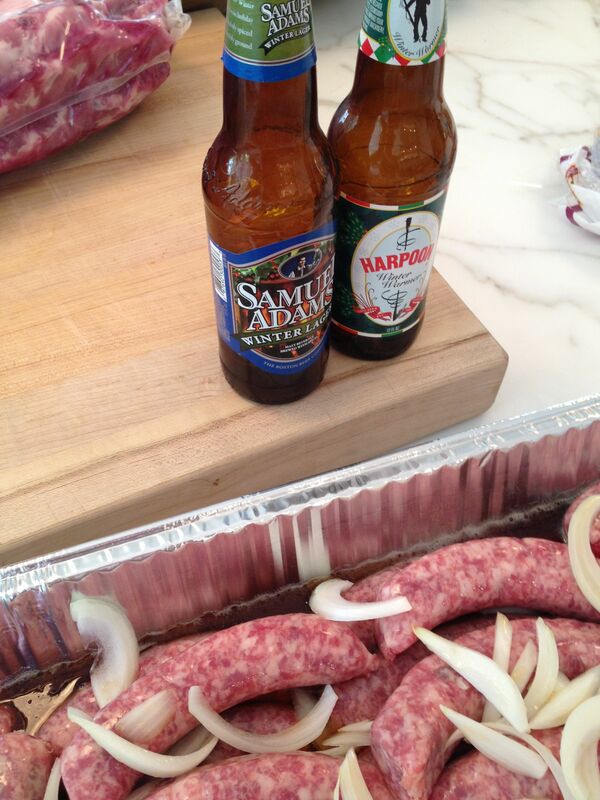 This entry was posted in Main Courses, On the Grill and tagged brats, Father's Day dinner, grilled bratwurst, make-ahead ribs, ribs, ribs on the grill by subeeskitchen. Bookmark the permalink. I was at the party and enjoyed the beautiful setting-fireplace, patio, grassy lawn, and veggie garden Sue and her husband have created. The food was as delicious as it sounds and the company delightful-we have great neighbors! I’m inspired, Sue, by your method. 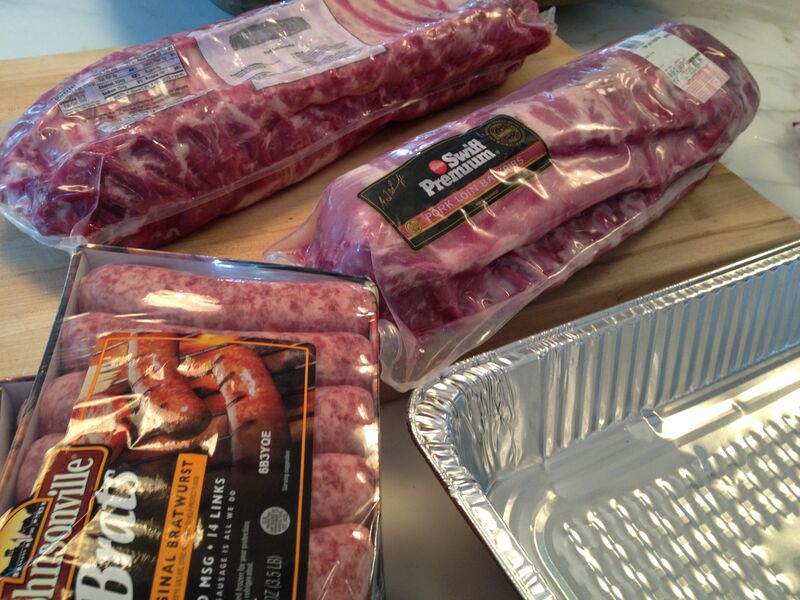 Braising both ribs and sausage a day before makes them seem doable, but 60 guests – even for a potluck – isn’t on my list of fun ways to spend an evening! 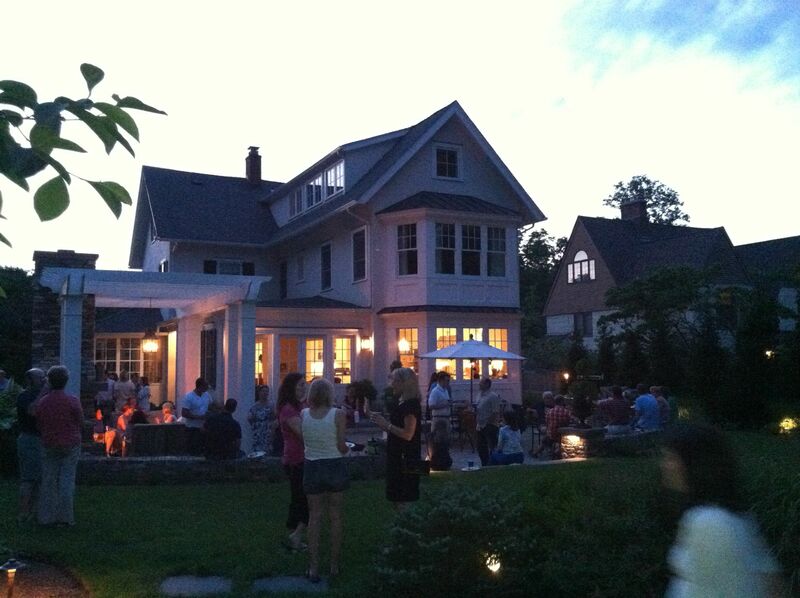 Your nightime shot shows what a perfect evening it was….and doesn’t the house look spectacular! As alway, you rock ! The house and garden do look amazing ! You make it sound so easy, Sue… which I know is not. Great, beautiful party, by the way. 6 racks of babybacks for 60 people? How many brats did you serve? I ask only because I’m in a similar predicament with about half that number of people and have been himming and hawing about how many racks of ribs to get when there will also be plenty of burgers and brats. Looks like your event worked out! Hi Joe — there were 2 large Costco packs of brats, so maybe 30 or 40? There was a lot of other food too — people brought side dishes. The meat in this case was more like appetizer-portion, and it all disappeared fast. 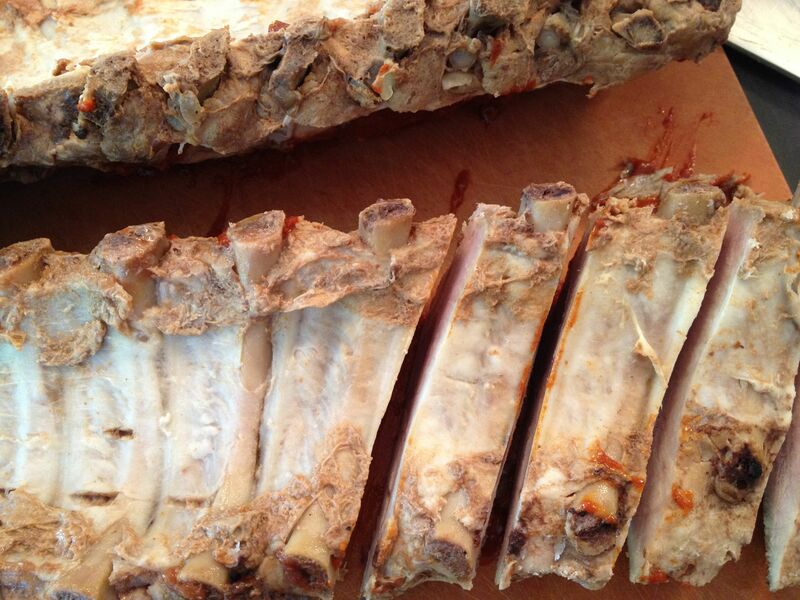 (Ribs first, even though I cut them into small portions.) Next time I would double the amount (or invite fewer people!) Good luck with your event.